The gristmill in Western Pennsylvania was one of the first rolling mills in the country, processing corn, oats, wheat and buckwheat for local customers. Message summary: We are in the midst of this great spiritual battle and God’s call is that we actively stand our ground. “Remember those earlier days after you had received the light, when you stood your ground in a great contest in the face of suffering” (Hebrews 10:32). “Therefore, take up the full armor of God, so that you will be able to resist in the evil day, and having done everything, to stand firm” (Ephesians 6:13). “But he who stands firm to the end will be saved” (Matthew 24:13). In America we can watch a lot of football at this time of year with college bowl games and the professional postseason. Of course this is a subject that will not “connect” to everyone, including many who live here in the USA, let alone other countries, so I’ll keep the illustrative portion of this message brief. Consider the goal line stand. You’re on the defense and the opposing team has the ball on the one yard line with 1st and goal. You are a lineman and your job is to keep the opposing team from moving the ball that one yard, although they have four opportunities to do so. You must stand your ground! Standing your ground is an important posture or position to take when staying faithful to a cause important to your heart. Today so many of our brothers and sisters in Christ are standing their ground against tremendous opposition in this great contest. In the last several days I have read or watched documentaries about three places where life has been really hard in 2018; North Korea, Kurdistan* and Venezuela. Of these the most hellish is North Korea where the people are expected to treat the dictator as a god. Using football as an illustration may have a sense of trivializing the very real contest in which they battle. The first daily text is a commendation of the first century Hebrew believers who had stood their ground in a great contest in the face of suffering. The Greek word translated “contest” is “athlasis”, which is a root of the English word athlete. All we who follow Christ are involved in this great contest, what the Apostle Paul calls “The Race” (2 Timothy 4:7). Some approach this contest in a passive sense, as if we are just standing on the sidelines as spectators. But others rightly recognize that we are in the midst of this great spiritual battle and God’s call is that we actively stand our ground. The apostle Paul alluded to this stand when he commissioned followers of Christ to, “Take up the full armor of God, so that you will be able to resist in the evil day, and having done everything, to stand firm” (Ephesians 6:13). The early believers to whom the Book of Hebrews was addressed were enduring persecution because of their uncompromising stand for truth. They stood their ground even in the face of tremendous suffering and this is also the current experience of many all around the world. In fact as we prepare this message from the comfort of our home we feel so far, far removed from their plight. Today may God help us and all that read this to remember them in prayer as they stand firm in the midst of the great conflict. And may the Lord empower each of us with grace to stand our ground in regard to the particular issues we deal with today and in 2019. Earnest believers, l invite you to join us as we stand our ground regarding faithfulness to apostolic doctrine (Acts 2:42, Jude 3) and Biblical standards of morality (Galatians 5:19-20, Colossians 3:4-6, 1 Thessalonians 4:2-4). The Bible speaks of a great falling away that will occur in the end times (2 Thessalonians 2:3). I wonder if we are seeing that before our very eyes. Stand your ground; for if you don’t stand you’ll surely fall! There’s much truth in the saying, “If you stand for nothing, you’ll fall for anything.” “But he who stands firm to the end will be saved” (Matthew 24:13). Daily prayer: Jesus, You warned Your listeners as You sat on the Mount of Olivet that at the end of the age nation will rise against nation, kingdom against kingdom, famines and earthquakes will be commonplace. Believers will be handed over to be persecuted and many will turn away from the faith as wickedness increases. In the midst of such dark desolation we cling to the bright promise, full of hope and motivation for those who walk steadfastly with You; he who stands firm to the end will be saved. We will conquer the enemy as we stand our ground, for the battle is not ours, but Yours, Lord Jesus! Amen. Kurdistan* Actually in the last several years life has been better for the Kurdish people and the book I read, “The Miracle of the Kurds: A Remarkable Story of Hope Reborn in Northern Iraq” spoke of evangelism among them. The people in North Korea and Venezuela on the other hand suffer greatly as do people in so many places around this world. 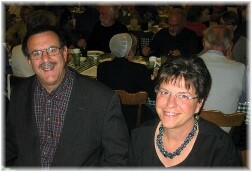 Jack Brown, a reader of this series from Michigan, sent us an interesting study he had done on God’s promises that will bless our readers as they face another year. 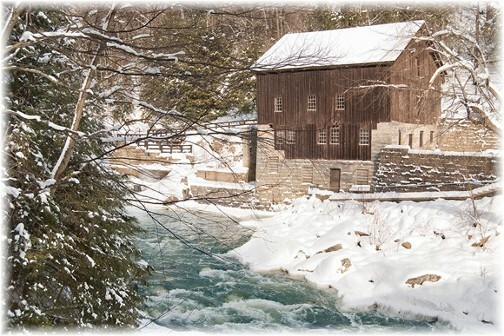 Today’s gristmill photo was taken by our friend Howard Blichfeldt and was used with his permission. He comments: “This is a beautiful location no matter what time of year you arrive. I have seen it in all seasons since the time my father brought me here as a child to fish or walk. One must be careful though as Slippery Rock Creek can be very dangerous water and the shoreline rocks are as slippery as black ice. That said, this is a place worth visiting more than once and winter is especially pristine. The water is pure and the blanket of snow makes everything look so unspoiled. The sounds of winter are plentiful here whether the occasional chatter of a red squirrel, the tapping of a lone woodpecker, the sound of rushing water or the absence of anyone else, I am always drawn into the peacefulness of the moment. Nature always finds a way of reminding me of its healing power, a force exceeded by no one but the One who provides it.” Howard’s photo site is here.